Sunday morning came and it was more difficult than usual to get up and out for a run. A full day out and about enjoying good food, wine and beer as well as a good friend’s 30th birthday party, which led to a lateish night. As a consequence I was left late and the 2 hour run was reasonably tough. In my head I wasn’t really looking forward to the run having had some stomach cramps through the night and a sore calf from overdoing it at the gym the previous morning (I think I was trying to give myself an out). BUT – not training was hardly going to get me closer to completing the marathon in around 4 hours – so up and at ‘em. Camelbak filled with a litre of water and my soft food pack I trundled off down the road not with a whole heap of enthusiasm. Diane is training for the 5.7km run at the Gold Coast so I agreed to meet her at the start of the Mullum Mullum Creek trail and join her for a couple of kms before heading onto the Eastlink trail. I was slow meeting up with her, but she waited and we ran for a couple of kms together – a perfect day for a run really. 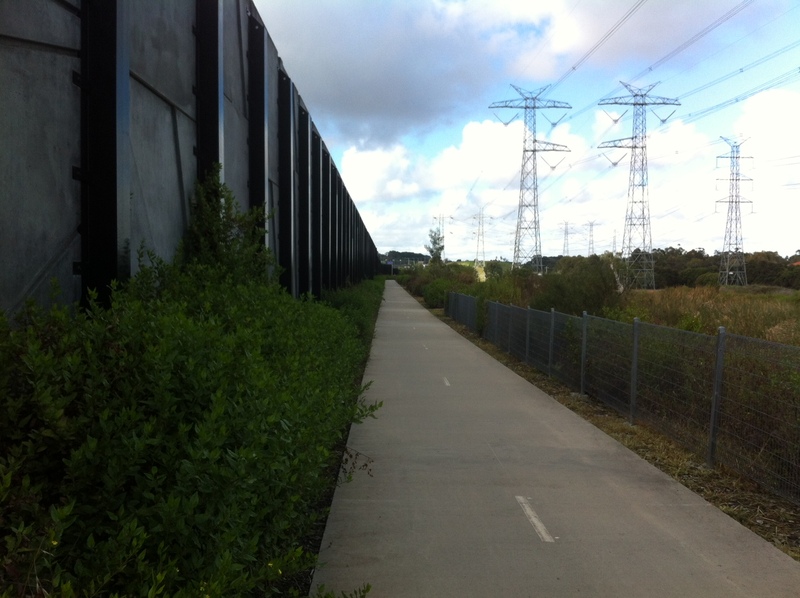 The Eastlink trail is actually a great run along the side of the freeway. It’s a good track, albeit it a little hilly but it runs through some beautiful parks and wetlands – well worth a look, if not on foot then by bike. They’ve succeeded in making a pretty average environment look quite good. The first 13kms I was tracking ok, averaging a reasonable pace and looking to complete a half marathon quicker than my previous hit out. And that’s when the poor preparation, bad diet, drinks from the day before and a late night all started to have an impact. For the first 13kms I was averaging 5minute 35second kms. For the next 8kms I averaged 6minute 8second kms. There were a few traffic lights and a some hills, but not enough to make that big a difference. Only one thing to blame – me. Important lesson reinforced – if you don’t prepare properly and be careful with what you eat and drink – your time will suffer and it will hurt a whole lot more. Amazing huh? Who would have thought! Nothing here is new – I know – it just goes to show though – there are no short cuts and if you aren’t committed – you’ll pay the price. From this point forward with only 15 weeks to go I’m going to look after myself a lot better! Truly!! I was desperately keen to hop in the pool for a swim when I got back, after first scoffing down a handful of grapes and a Powerade. 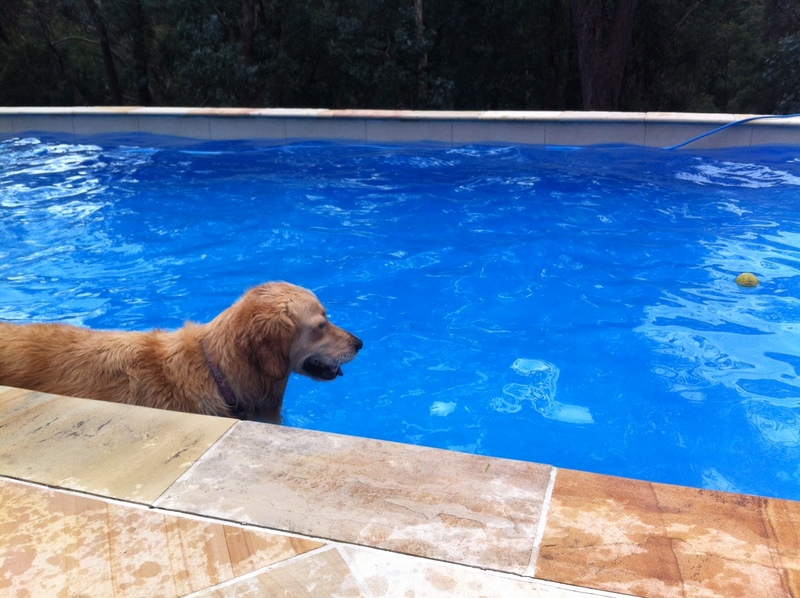 Now those of you who have been following my blog know that I have an overly active golden retriever with OCD named Missy. Missy loves going for a run, but nowhere near as much as she loves chasing a tennis ball and going for a swim. Since she hadn’t been for a run this week she was keen to get some attention and as I swam up and back she was going to force me to take notice of her. First she dropped her tennis ball in front of me at the end of the pool hoping I would throw it, and when I ignored her – she jumped into the pool to push the ball in front of me while I swam (see the photo). Needless to say – the swim was not without disruption. She will get some runs this week which will certainly make her happy, although I did reread my training schedule wrong so the bulk of the intervals aren’t until next week – luckily she can’t read the blog (she’s too young to have internet access). Also quick update on my fundraising for the Fight Dementia Campaign – it’s going really well so far – many thanks to those who have donated or provided words of support and encouragement!!! Very much appreciated! This entry was posted in Fight Dementia, Fund Raising, Marathon Training and tagged alzheimer's, alzheimer's association, dementia, dog, dogs, eastlink, endomondo, fundraising, gold coast, golden retriever, marathon, music, playlist, preparation, runners, running, training, walking the dog. Bookmark the permalink.